Where there's trade, there's taxation. And more often than not these days, that means United States taxation. What is the US tax treatment of mergers and acquisitions? How are joint ventures and other hybrid entities taxed in the United States? How does the US foreign tax credit work? What are the most tax-beneficial ways to form a business in the United States? How can special profit and loss allocations under US partnership law be used in international transactions? The only easily readable overview of the subject available, this book is useful in two different ways. Reading it cover to cover provides a crystal-clear `picture' of the US tax system, yet the book is also of great value as a quick reference when a US tax problem needs to be solved. 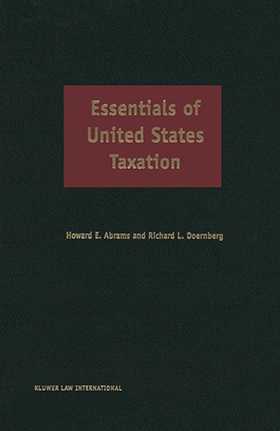 Numerous real-life examples make specific provisions of the US tax system easily understandable even to readers with no background in the subject. Overview of Taxation in the United States. Federal Income Taxation: Structural Issues. Federal Income Tax: Conceptual Issues. Legislative, Administrative and Judicial Aspects. The Corporation as a Taxable Entity. The Structure of Partnership Taxation. A Partner's Transactions with the Partnership. Acquisitions of Partnership Interests. Dispositions of Partnership Interests. Basic U.S. Jurisdictional Tax Principles. The Role of Income Tax Treaties. Filing, Withholding, and Reporting Requirements. Introduction to U.S. Business Activity in Foreign Countries. Controlled Foreign Corporations and Related Provisions. Foreign Currency. International Tax-Free Transactions. Tax Arbitrage and Economic Substance. Foreign Sales Corporations. International Boycott and Foreign Bribery Provisions. Estate and Gift Taxation for Resident and Nonresident Aliens.